In principle - the requirement of choice, either you are with Russia or you are with the West, this is the Middle Ages. At what stage are relations now at between Moscow and Washington? What will Russia, Iran and Turkey’s cooperation on the settlement of the Syrian issue lead to? And is there a reason for the European Union to see a threat in Russia? 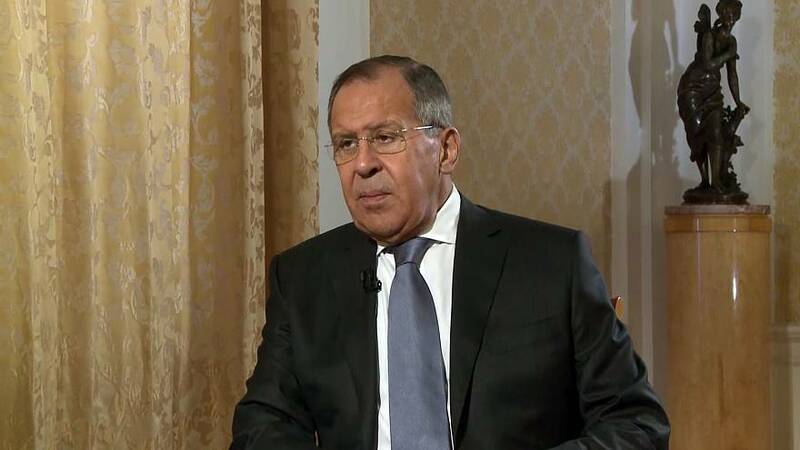 I will address those and other questions to Russian Foreign Minister Sergei Lavrov. My first question is about the relationship between Russia and the United States. A year after Donald Trump became President, these relations remain as strained as ever, did Russia expect more from Trump’s presidency? I would not say that we were prisoners of some kind of expectations. There is a lot of speculation now, that Russia had bet on Trump and lost. There were indeed statements in support of the election of US President Donald Trump, but they had been made by some politicians, a few public figures, some parliamentarians. But all officials, starting from the President and down to the foreign minister, including other people who are responsible for foreign policy, never made any bets and said very clearly that the Russian Federation, in every case, in every country, is willing to work with whichever president and government that is chosen by the people of this particular state. And in fact, it is so. We could not read into the future, could not (laugh) and did not interfere, there is still talk about some kind of state intervention in the pre-election process, but I still have not seen a single fact. I very much hope that those tendencies that, as we see, dominate Washington, will die out. The president, though in need of making some compromises and taking the mood in Congress into account, still follows his own line, and has repeatedly confirmed his sincere intention to fulfill what he said during his election campaign – to develop normal, mutually respectful, mutually beneficial relations with Russia. And yet no one forced him to sign sanction laws and give weapons to Ukraine. He has to compromise, considering the mood in Congress when the law is adopted by a number of votes that’s more than sufficient to overcome the presidential veto, then the rules of domestic policy come into force, and the President already has to evaluate his relations with Congress on a wider range of issues. This is life, although it is certainly sad that under Trump during a year of his presidency our relations have not improved, compared to what it was in the period of the Democratic administration, and even to a certain extent have worsened. I mean of course the ‘raider seizure’ of our diplomatic property, which contradicts not only the Vienna Conventions but also all the principles upon which the American Constitution and American society are based, ‘private property is sacred’. This situation was trampled on and we are now launching, as we have already said, legal action in the USA. You had bet on pragmatic relations, is there any hope for pragmatism left? Pragmatism breaks through here and there. Our cooperation in space did not stop, our cooperation in Syria did not stop, although it is difficult, too many interests collided, and despite this, the southern de-escalation zone, which was created with the participation of Russia, the United States, and Jordan, is working well. Although, it is, of course, necessary to fulfill the agreements reached in this zone on the withdrawal of all non-Syrian forces from this region. Since the very beginning of their involvement in Syria, the Americans have staked themselves on the Kurds and ignored whatever Turkey’s position was. And this position is a reality. It is not a secret for anyone and was not a secret, Turkey considered some factions in Syria as an offshoot of the Kurdistan Workers Party. The Turks and a number of other countries put them on the list of terrorist organisations and this was all known. The Turkish have repeatedly said that they would prevent the Kurds from taking control of the border between Syria and Turkey in every way possible, but nevertheless, during this period, the Americans have consistently armed Kurdish forces, and quite massively so, while ignoring the Turkish position. This game playing with the Kurdish issue that the US is now demonstrating, in only one part of the region, with only a narrow understanding of its geopolitical implications is a very dangerous game. It can lead to major trouble in a number of other countries where Kurds live. We need to think about how to ensure equal rights for Kurds in the current borders of the countries in which they are located, rather than trying to get the whole region agitated like it was during the last century by our Western colleagues. Under President Trump, the presence of the United States in the global arena has been diminishing. Do you agree with such a widely circulated statement or do you see America as just as involved in global affairs as in previous decades? I do not agree that the American presence in international affairs is shrinking. Yes, President Trump said that we must make America great again, and America first and foremost, but those who understood this slogan as an invitation to isolationism and the renunciation of external projects, they were wrong. Not only is the US’ international presence not diminishing, it is expanding its military dimension more and more. As in Syria, where no-one had invited them, as in Afghanistan, where they were invited, but their 15-16 year presence there has not brought about any good. The terrorist threat has not gone away, the production of drugs has increased tenfold. It worries both us and our Central Asian partners. It must also worry Europe because drugs go there and the terrorists spread all over the world regardless of any border. It’s the same thing in Iraq, they declared a full withdrawal from Iraq under Obama, now they’ve restored their presence there and their presence will grow. And I won’t even mention how the (US) military preparations in South-East Asia are being pumped up, under the pretext of the nuclear problem of the Korean peninsula, but on a scale that goes beyond what is necessary to contain the threat that the Americans see in North Korea. And it’s done clearly with the goal of settling in the South China Sea, in the context of those territorial disputes that China has with a number of Association of South East Asian Nations (ASEAN) member-states. And, of course, on the subject of global issues where the US presence raises many questions, we have the global missile defense system, whose European section is already being actively put in place in Romania and Poland, along with its East Asian section in South Korea. And now Japan has also become actively interested in this same task. So it turns out that this global missile defense system poses a problem not only for us but also for China. So, as you can see, the US presence is growing and not in a harmless way. Over the last year European countries and the EU, following the USA, accused Russia of propaganda and supporting populist and far-right parties. Would a weakened and destabilised Europe be in Russia’s strategic interest? Of course not! We stated this and our President said this, we are interested in seeing that this confusion and uncertainty that is now arising in the European Union is stopped. We want to see Europe strong and stable, it is our largest trade and economic partner, and despite the known negative consequences of the last three years, Europe remains our largest partner and investment partner, and of course, we want this structure – the European Union – to develop steadily and predictably. The need for energy resources is growing in Europe. Those needs can be satisfied with the projects that we are now discussing with our European counterparts, the Nord Stream 2 and the Turkish Stream. By the way, last year Gazprom had a record increase in supplying Europe with an unprecedented volume (of gas), and so all this talk about the necessity of avoiding the dependence on Russian gas, is exclusively a political game, the goal of which is to artificially destroy our natural economic partnership. What are Russia’s interests in the Balkans and how do you see the evolution of this part of Europe? The Balkans are our historical partner, we have done a lot to ensure the security and statehood of many Balkan countries, during the Russo-Turkish wars, during the First World War, and during the Second World War. And our historical roots, our spiritual, religious roots (as most of the inhabitants of the Balkans are Orthodox), certainly shape relations between the people of the Russian Federation and the countries that are located on the Balkan peninsula very well. We have had very good relations over the last few years with Serbia, Slovenia, I would say, the dialogue with Macedonia is going along very well. Recently, a period of some kind of a pause in the relations with Croatia was reversed, the Croatian President visited Russia, I met with my Croat counterpart. Of course, the situation in Montenegro is worrying, there are attempts to use it as some kind of bargaining chip in the Russophobic fight, they have had NATO membership imposed on them. But nevertheless, we have very good relations with Montenegro, I just don’t understand why they had to get involved in this Russophobic campaign, but well, it will rest on their conscience… But please compare the facts. There is almost no Balkan country which has not had a US ambassador sometimes with the help of European ambassadors demanding they stop being friends with Russia. They do it almost publicly in Serbia for sure – and compare this with what we do in the Balkans. We simply offer mutually beneficial projects. We never ask our partners, either in the Balkans or anywhere else, to stop developing relations with this or that country. This is the fundamental difference between our foreign policy and the foreign policy of the West, and when they say that Russia interferes in internal processes without a shred of proof – well, I think that independent, objective media, and I put “Euronews” in this category, should show those actions that are openly undertaken by Western countries in the Balkans with public demands to stop being friends with Russia. In principle – the requirement of choice, either you are with Russia or you are with the West, this is from the Middle Ages. Ukraine’s parliament adopted the so-called Donbass reintegration law, declaring Russia to be an aggressor state, and the territory on the East of Ukraine – occupied. Your ministry called it a preparation for a new war. Are the Minsk agreements still in force from Russia’s point of view? And how do you see the solution to this conflict? The Minsk agreements stay valid from the point of view of international law because they are approved by the UN Resolution, for which execution is obligatory and not a single Ukrainian law can be higher than the UN Security Council. All of our partners from both Western Europe and Eastern Europe and the United States confirm the necessity of implementing the Minsk agreements. This law on integration, officially it has a different name, it has just been dubbed the law on integration, it does not, in fact, mention the Minsk agreements in any way. In fact, I would say this is the law of disintegration because it is all directed against the logic of the Minsk agreements which require a single public political space through a dialogue between the Kyiv authorities and this part of the Ukrainian state. Therefore this is a very disturbing law, and we will talk with our colleagues and assistants of the leaders of the Normandy format, and in the contact group, I am convinced that we should not show any weakness in pursuing the radicals who decided to bury the Minsk agreements. Is there any chance that UN peacekeepers could be stationed in Eastern Ukraine before March? It depends on those who have not yet given us any concrete amendments to the draft resolution that Russia has introduced. Our logic here was very simple: the Minsk agreements are being implemented under monitoring and with the participation of the Organisation for Security and Co-operation in Europe (OSCE). The OSCE has created a special monitoring mission, there were concerns about the safety of these observers, and for a long time, the Russian president has offered to give them light weapons to be more protected. The OSCE considered it impossible because they had not practiced armed missions before. Then in September last year, we introduced a draft resolution in the UN Security Council that is very simple and directly tied to the Minsk agreements: wherever OSCE observers work, they are protected by UN peacekeepers. Our partners have said that this is the correct step, but let’s expand this concept a bit. They suggested not following the task of implementing the Minsk accords but suggested substituting everything that is written there with a very large power structure under the guise of a UN operation. Is Russia against this idea? Russia can not support ideas that contradict the decision of the highest UN body responsible for peace and security. The resolution that approved the Minsk agreements is obligatory and has to be executed. Russia surprised the whole world by securing an agreement with Turkey and Iran on Syria. What are the future steps of these three countries in Syria? Does Russia see Turkey and Iran as allies in devising a common Middle East influence policy? We do not look so far; we believe that we need to finish now what was started in Syria. When the Obama administration turned out to be completely incompetent in terms of the agreements reached between us and Washington to move forward with the ceasefire, we had no choice but to work with those who keep their word. Those who, despite all the differences in approach, are still committed to the search for common positions, are committed to the search for a settlement that will preserve Syria as a single state with territorial integrity. And those were our Iranian partners, who, like Russia, were invited to Syria by a legitimate government, to help fight terrorism, and Turkey showed the same willingness as well. At the end of 2016 the first summit took place, it launched the Astana process, which resulted in a sharp decline in the level of violence, moreover, the most important recent event in Syrian affairs was the Sochi Congress of the Syrian National Dialogue, which approved 12 principles for the future state structure of Syria. Yes, not all opposition groups were adequately represented in Sochi, but it was a Forum which represented an unprecedented variety of all parts of Syrian society.